When space is limited and compact, people are looking to get the most out of every inch of a space. This need is benefitting spaces with outdoor areas available especially terraces. When you hear the word ‘terrace’ it gives the impression of luxuriating outdoors, enjoying, meals, and hosting friends. A terrace offers a different experience than a garden apartment or a balcony. Unlike a garden apartment that offers a patio on the ground floor or a balcony, that is a small overhang and not very large, a terrace stands out beyond the rest. The outdoor terrace allows New Yorkers to step outside their high-rise confinements. 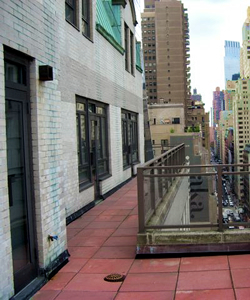 As a rule, a terrace is an outdoor space directly off the space positioned on the building’s setbacks. The terrace does not extend beyond the building’s façade like a balcony that overhangs. A terrace is an open space different from a loggia that is a covered outdoor area. The ‘saying you get what you pay’ for is certainly true when searching for private terrace. Terraces are not free, but according to many real estate experts, a private terrace is generally valued at half the square foot price of the indoor space, of course depending on the property and market. A terrace, also a balcony, characterize a space interested in joining the indoor and outdoor spaces. Terrace, in Latin meaning ‘earth’, relating to the terrace built on raised structures. Essentially, a terrace is built on a raised area likely atop of a building or property. A terrace is an open outdoor area, although usually found on the top floor may also be found on lower floors placed on the setbacks. Today, modern terraces are used in various ways. Open gardens are becoming more popular among many people in urban areas. A beautiful green space in the middle of a bustling New York City is truly a treasure. Unlike the balcony, a terrace is able to support a pool or Jacuzzi. Direct access to a terrace is not available in all buildings. Several properties enclose the top floors to sell at a higher rate due to the appeal a terrace offers. Other properties only allow access to the terrace through a fire escape or a separate staircase. An authorized floor plan is required to build a terrace. 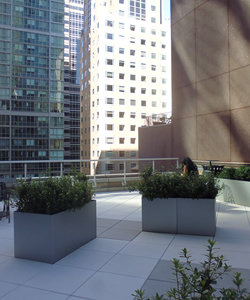 If your interested in leasing or pruchasing an office in Manhattan that features a Terrace, just give us a call - we have data on all the building proerties throughout city that contain the outdoor space your looking for!